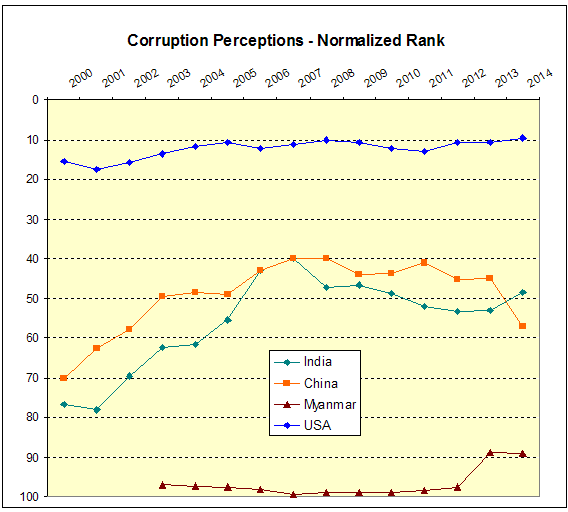 Last year, when I wrote about Corruption Perceptions, I said: I’ll be very interested to see if the new government in India significantly affects corruption perceptions in the next survey. The 2014 data are available, and it’s had an effect. How significant is it? 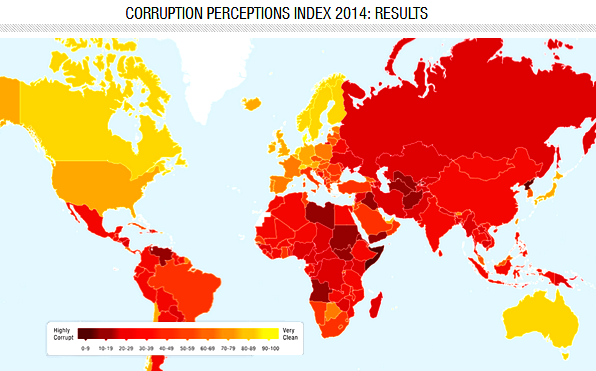 Transparency International makes an annual Corruption Perceptions survey, covering 170-180 countries. (In 2014, it covered 175 countries and territories.) It calculates a score for each one, and ranks countries according to the score. They provide this information as a table – and in the neat map I’ve shown as a screen-grab above. I look at these data for India and Myanmar – both countries where I follow the business conditions – and also for the US and China as reference points. So here are the 2014 scores. India’s better, China’s worse. India improved its score, from 36 in the last two year to 38 in 2014. It’s a nice, though small, turnaround from the 2007-2011 slide. China meanwhile sharply lost ground, falling from a score of 40 last year down to 36 (its 2011 level). This change means that India actually ranks better than China for the first time since I started looking at these numbers. 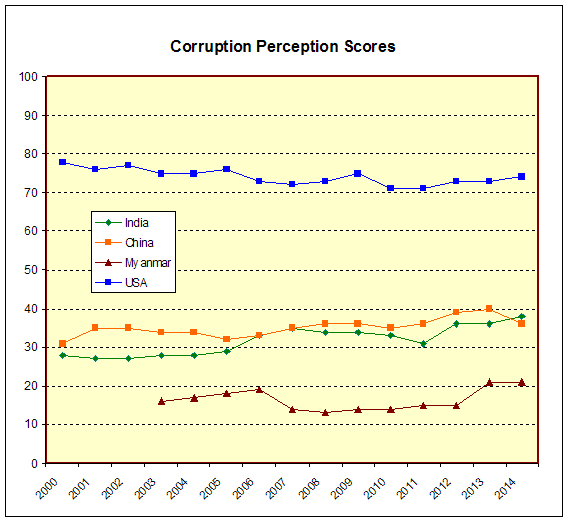 The people surveyed consider governmental corruption worse in China than in India. India ranked 85 of 175 countries while China ranked 100 of 175. Myanmar leveled off in 2014 after a sharp improvement in 2013. Unless there’s a significant change on the ground, people are unlikely to change their views of the corruption there. Its current rank of 156 of 175 isn’t in itself impressive, but it’s a whole lot better than its 2011 ranking of 180 of 183 countries (only ahead of North Korea, Afghanistan, and Somalia). Right now, it’s similar to Cambodia though well behind Indonesia. The US improved its score from 73 in 2013 to 74 in 2014, also continuing a gradual rise since 2011 – which was enough to give it a rank of 17 of 175, in the top ten percent of countries. What I find interesting is that while these scores and rankings shift from year to year, the variation is usually small. In 2014, none of them have moved enough to change their color on the map above. This suggests that there’s a “corruption environment” that is easier to tweak than to change dramatically. Also, since this survey measures perceptions rather than any objective reality, I’m never sure how much of the shift describes changes in perceptions unrelated to any change in the extent of corruption. So I have mixed feelings about this exercise. I think it’s valuable to shine the spotlight on corruption, as Transparency does. Perceptions are also important in terms of willingness to do business. But it also demonstrates how much effort and commitment is required to make significant changes. This entry was posted in Asia, Doing Business in India, Economy and tagged Asia, Burma, Doing Business in India, economics. Bookmark the permalink.